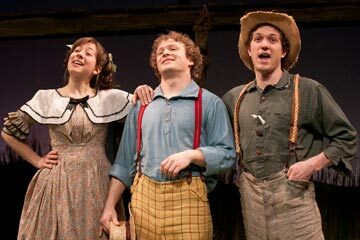 Rachael Joffred as Becky Thatcher, Jefferson Haynes as Tom Sawyer, and Brian Cowden as Huckleberry Finn in Mark Twain’s The Adventures of Tom Sawyer, by Laura Eason, at People’s Light & Theatre. People’s Light & Theatre presents Mark Twain’s The Adventures of Tom Sawyer, adapted for the stage by Laura Eason. It runs February 17 – March 13, 2011 on the Main Stage. David Bradley directs. 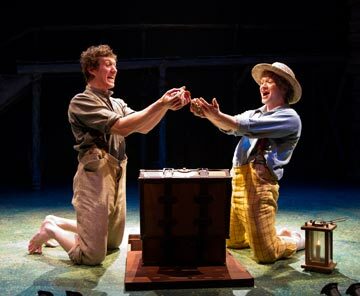 A lively adaptation of Mark Twain’s colorful American classic, The Adventures of Tom Sawyer features the hilarious antics of the mischievous Tom and Huck Finn, whose stories have inspired generations. Whether it’s graveyards at midnight, buried treasure, or whitewashing fences, every day is an adventure if you’re a boy growing up in a small town on the banks of the mighty Mississippi. The set, designed by James Pyne, features steps leading up to a platform made of wood. The simplicity of the structure and the rawness of the materials conjure images of a childhood fort or treehouse. Christopher Colucci’s music for the piece consists of a lively banjo and fiddle, familiar sounds from America’s history. The cast of eight includes a mix of newcomers, regulars, and longtime company members Alda Cortese and Tom Teti. The actors switch in and out of roles throughout the play, bringing over eighteen characters to life. “It is a lot of fun getting to be with these funny, quirky, and spirited characters,” Bradley says. “Tom lives adventure to the fullest. If he decides to be a pirate or fall in love, he goes all in. However, in the midst of his pummeling experiences, he witnesses the murder of Doc Robinson. Tom starts to see the shadows of the world while he is still immersed in the innocence of youth. The Adventures of Tom Sawyer begins on Thursday, February 17th at 7pm and runs through Sunday, March 13th. Audiences are encouraged to join the artists after each performance to discuss the production. Single tickets are $31 for adults and $20 for children. For tickets, call the box office at 610.644.3500. Special discounts are available for groups of 10 or more. For more information or to purchase group tickets, call 610.647.1900 x134 or email group@peopleslight.org. Actors, prices, performances dates and times are subject to change. Additional service charges may apply. Contact the box office for more details. TARGET Access Night is Thursday, February 17th at 7pm and all tickets are half-price. Call the box office or visit us online at PeoplesLight.org and use the promo code TARGET. People’s Light, in partnership with the Chester County and Delaware County Library Systems and select middle schools, launches a Big Read program centered on Mark Twain’s The Adventures of Tom Sawyer. The Big Read, a program of the National Endowment for the Arts in partnership with the Institute of Museum and Library Services and Arts Midwest, is designed to revitalize the role of literature in American culture and to encourage citizens to read for pleasure and enlightenment. For reservations to these free events, contact the box office at 610.644.3500. Savor the secrets of Samuel Clemens! Enjoy the exploits of his boy hero! Bring the kids to this free family evening at People’s Light. Start with an interactive journey through the author’s wry and colorful life; take in a scene from The Adventures of Tom Sawyer; meet the man himself in a teaser performance by company member Tom Teti of a brand new, one-man show about Twain. Discount vouchers and free copies of the novel will be shared with the first 50 families who attend. Spend an evening with one of the keenest (and funniest) men in America. This brand new one-man show, drawn from Twain’s writings and performed by longtime company favorite Tom Teti, will debut this evening at People’s Light before it tours to several branch libraries. The free performance will be followed by a post-show conversation with the artists on Twain and the making of the piece. People’s Light & Theatre is located at 39 Conestoga Road, Malvern, PA 19355. For tickets call 610.644.3500 or visit PeoplesLight.org. This production is part of the TARGET Family Discovery Series. It is also sponsored by PECO and the Chester County Conference and Visitors Bureau.